In this day and age, there’s a good chance that you’ve found yourself in a situation where you need to plug more than two things into an outlet. This is a problem, but thankfully there are more solutions than ever! You probably even have a solution lying around your home. You dig through a couple of boxes before you find it — a rectangular brick with several outlets attached to a cord. Your problems are solved! The answer is that it depends. Do you need a power strip or a surge protector? What’s the difference? Does it even matter? Thankfully, the team of residential electricians at Delta Electrical is here to help set the record straight, ensuring that you make the right choice for your specific needs. If you’ve ever wondered which item to use for a given situation, you’ll find the answers in today’s post. Keep reading to learn more! 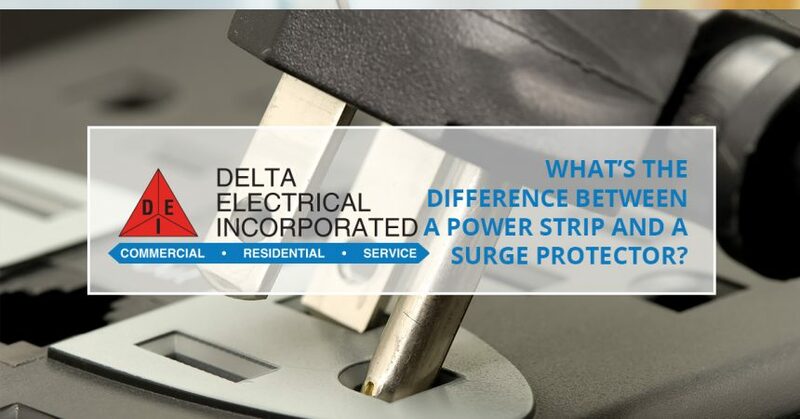 Probably the best way to sum it up is to say that a surge protector, as its name implies, can protect whatever is plugged into it from surges in your electricity. As you probably know, most of the outlets in your home runs on 120 volts of electricity. Some items require 220 volts, such as some washing machines and dryers, refrigerators, and other large appliances. If your home is equipped with a workshop, your larger power tools like table saws, bandsaws, and router tables can sometimes require 220 volts. Generally speaking, you’ll want a surge protector when you need to plug in a computer or any other electronic device. It’s also important to note that you should replace a surge protector if you find yourself in a situation where your home loses power because of a lightning strike, because it will mean that the surge protector did its job in protecting your computer. What many don’t know about surge protectors is that they have life spans. Although there is no set amount of time that a surge protector can last, you should plan to replace your surge protector every couple of years to ensure that it always works. You should also know that many surge protectors come equipped with a light that lets you know it’s still working. Be sure to consult your owner’s manual to see if yours comes with this feature. Another interesting thing to note is that once your surge protector has run its course, it can still be used as a regular power strip. So what’s the takeaway? If it’s a computer or other valuable electronic device, be sure to use a surge protector. If you’re plugging in a lamp, an electric kettle, or something similar, a power strip will get the job done. Are You Dealing With Electrical Issues? Whether your home is newer or older, the reality is that it might have electrical issues. If you find that the circuit breaker trips regularly, an outlet just flat-out doesn’t work, or your lights are flickering, there is probably an underlying issue. Not to worry though, because the team of local residential electricians at Delta Electrical is here to help! We tackle each job with care and attention to detail that is unmatched, ensuring that your home and its wiring function the way it’s supposed to. We pride ourselves on getting the job done the right way, so regardless of the situation, you can count on us to lend a helping hand. Contact us today to get a free estimate for your next project.